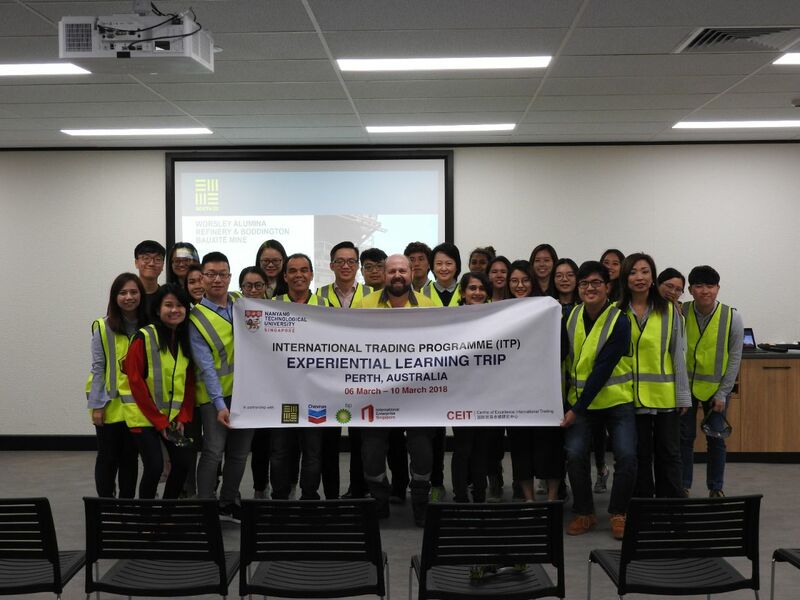 Students visited a mining site in Perth, Australia last year. These trips are arranged every semester to give students an in-depth experience in the industry. This August, undergraduates from across all disciplines in NTU can look forward to a new minor programme in International Trading. The course, which is offered by the Centre of Excellence International Trading (CEIT), was once exclusively taught to students in engineering, business and maritime studies, but is set to expand after positive student feedback. The International Trading Programme (ITP) will teach students business and technical knowledge in the commodities trading sector, a niche area which has gained interest in recent years especially among individuals who seek an alternative from the usual stocks and bonds. Graduates can expect to be skilled in areas such as enterprise risk management, and international tax and trading law. They will also be able to gain employment in firms that specialise in energy, gas, agriculture, as well as metals and minerals. This programme was originally launched in 2015 as a tripartite collaboration between NTU, Enterprise Singapore and partners from the international trading community. It was only available to students from select specialisations but student feedback has prompted it to expand its intake. Mr Chia believes that the key strength of the programme is its partnerships with notable industry figures. Some of them are BP and ExxonMobil, two major dividend players from the energy sector. These industry partners organise talks for students in the programme, providing many opportunities for networking with professionals in the field, said Mr Chia. He added that a substantial number of modules in the programme are also conducted by external lecturers, such as the industry seminars, keeping the lessons relevant and up to date. “This is what really makes the programme special, because not many modules in NTU are taught entirely by external professionals,” Mr Chia said. The ITP also conducts field trips to local companies every semester, which exposes students to issues affecting the trading industry. Last year, the programme arranged a company visit to Metalor, a gold processing company located in Jurong, responsible for refining about 150 tonnes of gold every year. More recently, the ITP has organised overseas learning trips for its students. Its first overseas venture was two years ago, when students went to Indonesia to visit a palm oil plantation and learn more about the process of manufacturing palm oil. Such trips also include visits to the headquarters of industry partners, which give students a firsthand understanding of the how the industry works. In addition, advisory boards are convened every year with the ITP’s corporate partners, said Mr Chia. These meetings are held to discuss feedback on existing curriculum, which CEIT will then review and make improvements on. From the first intake of students that graduated in August last year, 65 per cent had already secured a job even before graduating. He added: “The ITP also provides its students with better access to the relevant job markets. Mr Chia mentioned that students from non-related majors who decide to take up the programme can expect to have new job opportunities open up to them, especially within the trading industry. Students who are participating in the ITP also feel that it has greatly benefitted them. Ms Hannah Cheuk, a third-year student from Nanyang Business School highlighted the frequent industry seminars and experiential learning trips she has had, which have helped prepare her for the dynamic commodities industry that deals in areas such as agricultural trade.